We can recall many times when a surprise visit to our 42nd Street store has led to unexpected and exciting results. One of those times occurred on a spring afternoon back in 1995, when a noted American costume designer in the film industry, well familiar with Kaufman’s reputation for supplying hard-to-find military items, visited our store unannounced with members of her design staff. After welcoming our prestigious guests, we discussed in detail the British Army World War II uniforms they required for a new production about to begin filming in Italy. We listened carefully and understood the importance each time they raised their concern that all the uniforms had to be completely original from the period. Understandably, a number of the military items they required had become extremely scarce over the 50 years since the War ended in 1945, and we realized immediately how difficult it would be to supply them. So on top of this, when they informed us that their deadline to have everything available was less than two weeks away, their incredibly demanding inquiry suddenly seemed near impossible. The most important question they posed to us was this: "Could Kaufman’s supply all their requirements- and if so, could we supply everything on time?" In hindsight, it may have been sheer lunacy for us to have accepted this order in the first place given its complexity and the limited amount of time available. Yet, despite all of the inherent difficulties and some lingering doubts, we also felt equally certain that we could make it happen. So we accepted their challenging order and gave our assurance right there on the spot that we could supply everything they required and do it all within the time allotted. While this designer’s actual presence at our store clearly highlighted the significance of the order, her decision to come to Kaufman’s in the first place- and to rely on us- and to trust in our commitment to supply the order on time- and of paramount importance, for Kaufman’s to ensure its historical accuracy- would all prove to be invaluable to her. Sure enough, ten days later we delivered their order complete- a full array of original British Army WWII issue- and dated!- desert field uniforms so outstanding that the most discerning British military collector would have been astonished! As we learned later on, most everything we supplied was immediately shipped to Italy where every item was meticulously copied in the sizes required and the exact reproductions were worn by principal actors in the filming of The English Patient, which in 1996 won nine Academy Awards, including the Oscar to this designer for Best Costume Design! Among all the musty khaki twill trousers and long sleeve shirts, rumpled bush jackets and light green knee-high socks we furnished was a uniform rarer than all the others, and yet, it was also the only item returned to us. 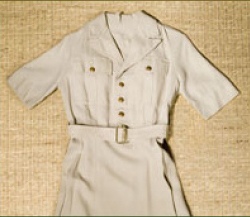 It was this same exceptional Royal Army (British Army) Medical Corps nurse’s dress in the photograph, which was not chosen for the film or ever used. We were very pleased indeed to receive it back, where today it holds a special distinction in the British Army Section of our own extensive Kaufman Military Uniform Reference Collection.